Pittsburgh Center for the Arts offers a potent and diverse Pittsburgh Biennial. A theme as amorphous as "Life on Mars" barely holds together the Carnegie International. 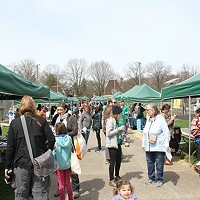 So it was probably wise of curators Laura Domencic and George Davis not to try rounding some 40 regional artists in the Pittsburgh Biennial into any corral beyond the confines of the Pittsburgh Center for the Arts and environs. Regardless, there's plenty of fine work to catch before the show closes Aug. 24. The Biennial's pleasures include Barbara Weissberger's six-panel watercolor "Turnpike U.S.A.," a vivid brief for mushrooms over musclemen, wildflowers over Fords. Josh Bonnet's large-scale abstract paintings intriguingly mix digital outputs with oils. Bovey Lee's amazing paper cutouts, a small roomful, progress from pretty to surreal to absurdly chaotic. Outdoors, Chris Lisowski's "Prometheus," a spectacular life-sized bald eagle sculpture, perches on a two-stroke engine upon a sawed-off telephone pole inside a picket fence labeled "Feral Farm," its message likely resonating with the black squirrel who resides nearby. Meanwhile, nearly a third of the Biennial artists are represented by short videos, screening in a curtained room. It's a good survey of recent work, with a few disappointments. 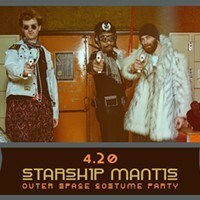 Highlights include "MNRY (AA Version)," which cuts together appropriated feature-film clips of screeching women, spaceships and a crepuscular empty room with a suggestive soundtrack to fabricate a witty pseudo-narrative; it's a familiar technique, but expertly done by Greg Pierce. Keith Tassick's "Canons" comprises 11 interludes in which editing effects and subtle sounds turn simple raw footage into a sophisticated study in veils, misdirections and shadow-work -- like making early spring branches resemble stained glass. Drew Pavelchak's contribution features enthralling stop-action animation (a paper-clip man!) but feels like a sketch; Hilary Harp and Suzy Silver's music video "Robot Love" is charmingly campy, if light on the media auto-critiques that usually give their work bite. Tom Sarver's "Fishing Report" is a good-natured documentary about rod-and-reel guys, but it's not ready for prime time -- you can't even hear what half the interviewees are saying. Elsewhere, two room-sized installations dwell in witty counterpoint. Denise McMorrow's "(A)Line" meditatively deconstructs discarded library books into a stump of the tree they once were. Next door, Adam Welch's "Reference" finds books approaching an alternate oblivion. He's fashioned a small library (shelves and all) entirely of carved, light-blue plastic foam. Some volumes have tumbled to the floor, presumably dislodged by whatever's causing the room's wild intermittent vibrations, this sound trading off with an eerie electronic keening. It's an H.G. Wells story where you're the remnant of Western Civilization the aliens are coming to polish off. If you have time for just three artists, though, try Dylan Vitone, Scott Pellinat and Sun Young Kang. Vitone's work is familiar locally -- deep-focus, black-and-white documentary photos digitally sutured into nearly cinematic faux-panoramas. But Vitone's ability to capture everything from the painted-face posing of Insane Clown Posse fans to the ritualized awkwardness of a debutante ball still amazes. He's at his best with street scenes of working-class young people and children, as with teen-age dudes roughhousing on a dock and the summer-blacktop romping of "Sprinkler." Perhaps most remarkable is how his subjects interact, subtly but powerfully, with the man behind the lens. Vitone, never just a fly on the wall, shoots with a sociologist's curiosity and an artist's eye. Pellinat's big floor-level installation "Reconstruction" anchors selections from Philadelphia's Center for Emerging Visual Artists (a Biennial bonus and a nice touch). All in blackish green, it's a shrunk-scale epic, where hundreds of 4-inch-tall bipeds with animal heads -- dogs, elephants, one officious moose -- fight, work and die. In the center, a heap of body parts; in one corner, single bodies writhe in pain or lie inert. You view "Reconstruction" looking down -- like a kid arranging army men for Tolkienesque apocalypse, or perhaps Zeus himself, surveying folly but obscurely implicated. In seemingly peaceful contrast, but equally gripping, is Korean-born Sun Young Kang's installation "Filtered Memories," based on her late father's diaries. 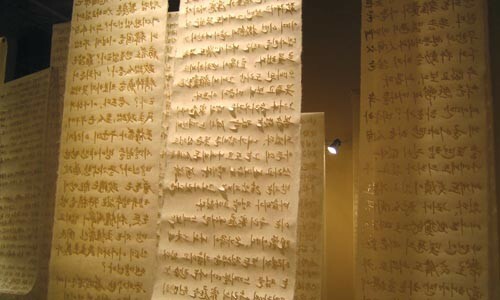 Long strips of translucent, delicately textured paper hang from the ceiling to form aisles, the journal excerpts inscribed in Korean script with burnt incense, and English translations below. Most date from the 1960s, when Sun's father was in veterinary school, struggling with adulthood. "Riding the train, I reflect about myself while listening to the music on the railroad radio station. The train is rushing along. All of my beautiful memories are getting away from me." "The other students' enthusiasm seems cruel to me. How can I make myself cruel like them?" "Filtered Memories" is like walking through the fragments of a life. Editor's note: An earlier version of this story misspelled the name of artist Barbara Weissberger.